The past subjunctive is the past tense of the subjunctive mood. The exact same verbs, expressions, and conjunctions that call for the subjunctive in the present (and future) require the past subjunctive in reference to subjectivity about something that happened in the past. Je doute qu’il ait fini ses devoirs. I doubt he (has) finished his homework. Il est ravi que tu sois venu à la fête. He’s delighted that you came to the party. Elle ne pense pas que Jean ait mangé. She doesn’t think Jean ate / has eaten. In the above examples, the speaker is describing a current feeling about something that happened (or not) in the past. Alternatively, the speaker can explain how he felt in the past about this action. Je doutais qu’il ait fini ses devoirs. I doubted he’d finished his homework. Il était ravi que tu sois venu à la fête. He was delighted that you came to the party. Elle ne pensait pas que Jean ait mangé. She didn’t think Jean had eaten. Je croyais qu’il avait fini ses devoirs. I believed he’d finished his homework. Il a dit que tu étais venu à la fête. He said that you’d come to the party. Elle pensait que Jean avait mangé. She thought that Jean had eaten. In the non-subjunctive examples, the verb in the subordinate clause happened before the main verb, so the past perfect is needed. 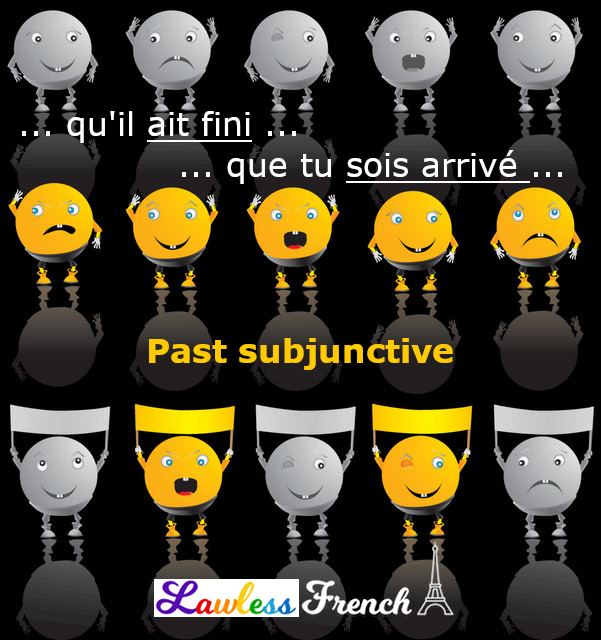 This means that when the subjunctive is called for with a main verb in the past, the verb in the subordinate clause should, according to strict rules of French grammar, be in the past perfect subjunctive. But in reality, the past perfect subjunctive is literary and extremely rare; the past subjunctive is used instead. Is the past subjunctive commonly used in spoken french? I read on another website that the imperfect subjunctive, for example, is more of a literary tense and the website gave an example: ‘il etait contente que nous aimassions son gateau.’ However, I am confused because if this is a literary tense, how else could you express the sentiment of someone being happy that people liked his cake in the past tense? Yes, the past subjunctive (je doute qu’il ait fini…) is used in spoken French. In your example, you’d just use the past subjunctive: il était content que nous ayons aimé… As I state at the beginning of that lesson, some nuance has been lost.